Start fundraising for yourself, other people, programs and places to help establish your cause. Support lifelong learning and inquiry. Find a cause you are passionate about and help make the venture a reality! Click each Area of Suppport (on the image) for more information. Crowdfunding People, Programs and Places in Education, Research, Professional Development, Sustainability and Social Good. Create, launch and gather support to establish ventures either for yourself or another individual. You can crowdfund to research an idea, develop your skills, undertake further education or even run a program for social good. Individual research, fellowships, funding study opportunities, scholarships, residencies, professional development course support, awards for achievements, career re-entry support, governance or volunteer training etc. It equips people to navigate society and provides you with a pass to a world of possibilities. Education or upskilling can be a great privilege, with finances being one of the greatest limiting factors to accessing education. Start crowdfunding ventures to provide yourself or someone else an opportunity to upskill, take new courses, advance their education or become lifelong learners. Crowdfunding to develop platforms or improve the fabric of buildings that promote lifelong learning. Charities, academic institutions and other organisations supporting learning and enquiry can crowdfund to develop their premises. Building, developing, expanding or refurbishing learning or innovation hubs, residential colleges to facilitate education for students, meeting spaces, facilities for education, research centers, classrooms, physical platforms for programs etc. Two or more people can crowdfund initiatives and activities for groups of people or organisations. Charities, organisations, community groups, academic institutions and more can crowdfund programs for themselves, or the community. Seminars, talks, conferences, awareness drives, group learning programs, professional development and career transition programs, mentor-mentee programs, activities promoting the United Nations 2030 Sustainable Development Goals etc. Research is one of the biggest factors to help gain a deeper understanding of the world, answer questions and develop solutions to problems we face. It is the key to unlock and allow development to maintain a future. Most often, research can be very expensive and ongoing, and may not have enough support to conclude research projects. You can crowdfund to assist different stages of research projects, develop models, purchase research material etc. At Fund Lifelong Learning, we believe that the pursuit to discover and build a better future starts with actions today. Ventures are encouraged to address issues your community faces, take small steps to action change now, to see results in the future. Creating ventures promoting social good is to build the world we wish to see. You can crowdfund for programs to feed the hungry, provide shelter to the homeless, support charity drives, volunteer programs etc. Professional Development is an ongoing process, through different stages in a lifespan. Its early stages include career preparation and entry while later stages include further skill and knowledge develoment. While each stage is different, synergy between these stages feed into each other and fosters lifelong learning. Crowdfund to create or participate in ventures for continuous professional development, upskilling and programs to enhance your professional careers. With todays advancement of technology, there is an increasing call to action for Sustainable Living. Crowdfunding ventures are encouraged to support the 17 Sustainable Development Goals to help maintain long-term economic, environmental and social sustainability, and to advance social good. Once fully funded, you can partner with these goals on the Partnerships forum to depict your progress and receive global support in line with the SDGs. What is the one common factor needed for a spectacular idea that helps solve global warming, a vision for change, programs for the community, establishing learning and teaching hubs, or even in the drive to gain more knowledge and further study? Online crowdfunding helps you overcome this barrier to help you realise your goals. It is a means of fundraising for your cause by campaigning and receiving donations from a large number of people, online. Ventures you create follows the “All or Nothing” funding model. With this, you will receive all pledged donations only after you meet your target amount. If you do not meet your target, donors will receive their money back. Donors typically trust crowdfunding projects where creators actively work to engage communities and networks to gather support. The creators’ involvement at the fundraising stage gives donors the confidence that there is commitment to reaching targets and accomplishing the venture. This method also acts as a safety net as donors get their cash back if the target amount is not met. The funding model adopted for Graduate Union ventures is “Keep it All”. All pledged donations will be immediately transferred to the project. 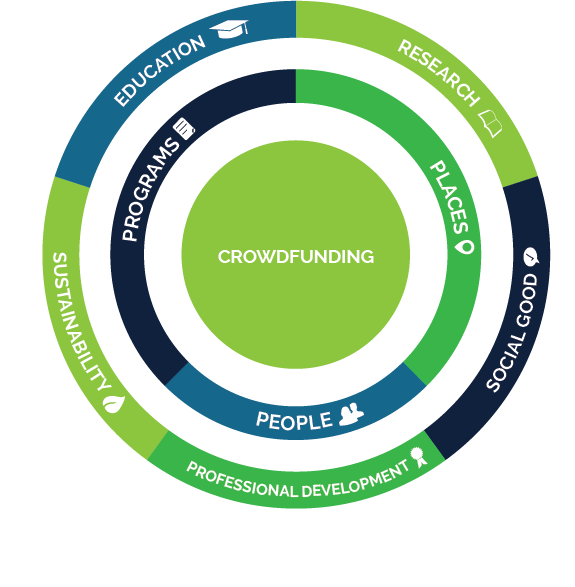 The unique structure of Graduate Union ventures enables crowdfunding activities for the year and endowment reserves to keep the project running in perpetuity. The fee amount usually charged for individual ventures will fund endowment reserves to start generating interest for future returns. This model allows all donations in support of our ventures to change hands, even if the target amount is not met. Funds will be apportioned to the endowment reserve and rolled over into activities for the following year.